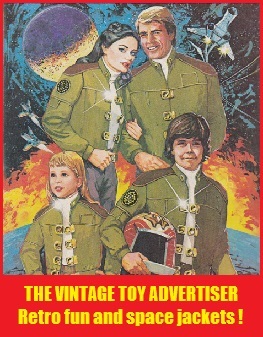 Never Mind the Adverts Pt14 – Action Figure Frolics and Fun, plus Name-that-Figure quiz, all in TVTA Color! In this edition, I finally get my hands on a Thirteenth Doctor action figure as portrayed by Jodie Whittaker in the BBC sci-fi drama Doctor Who. Judge Death stops by to give us an intimate portrait. X-23 Laura Kinney strikes some cool poses. Barbie meets a Dalek! And test your knowledge with TVTA’s fun-time action figure quiz: can you identify the characters and which franchise they belong to? The Doctor and Martha Jones finally meet. It’s only natural they strike a pose for the camera. Martha: Enough of the posing around. I just spotted danger ahead… I think I saw a Dalek! 13: Really? Where? Oh no, I just remembered I don’t like Daleks, neither do you. Let’s get after it! Martha: oh, it’s okay… looks like Barbie is dealing with the Dalek situation now. 13: Barbie… how did she get here? Dalek: Exfoliate! Exfoliate! 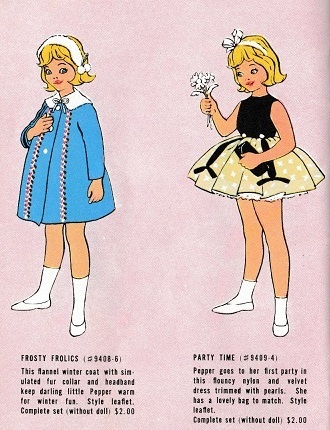 Barbie: All in good time my lovely new blue accessory… first we have to choose outfits, do our hair, bake cakes, then there’s this cool party I’m throwing later over at my place. What? You haven’t seen my dream house yet!?! They reply back… you’re not a nice guy… we’re gonna get Judgesss Anderssson and Dredd to sssort you out! Oh no… I’m sssso ssscared!!!! Sssso run! You have ten ssecondsss before I sssentence you to death!! X-23 – These boots are made for slashing, and a fistful of adamantium! X-23… how do you like it? And now, from Norwich, it’s the quiz of the week! Presenting, in glorious TVTAColorVision, the TVTA fun-time action figure quiz: Identify each character for 1 point, its franchise for a bonus point. Can you score more than 14 points? Don’t feel bad if not, this is quite hard, and Wooof only scored 5 points and he’s supposed to be an expert! Haha. Hard cheese, cat… What, shhhh, don’t tell the readers I only scored 3 points! Answers are at the end of the post… no cheating! Deduct a point if you do, naughty you! And finally, how about some cool cowboy figures from the 1980s? These were made by a company called Gerca. I remember nagging my mom for ages as a kid for a pack of cowboys very similar to these – I wanted them because their hats and guns were removable and the body parts interchangeable! Wild West figures. Gerca. 1980s. Made in Macau. Loose. Wild West figures. Gerca. 1980s. Made in Macau. MIP. Thanks for getting action figure quizzical with us 🙂 Join us again soon for another edition of Never Mind The Adverts, in glorious TVTAColorVision!! This entry was posted in Never Mind The Adverts... and tagged action figure quiz, action figures, Doctor Who, Doctor Who thirteenth action figure, Judge Death action figure, Never mind the adverts here are the toys, retro, toys, TVTA, vintage advertising, vintage adverts, vintage toys, Wild West figures by Gerca, Wooof, X-23 action figure on January 25, 2019 by The Vintage Toy Advertiser. 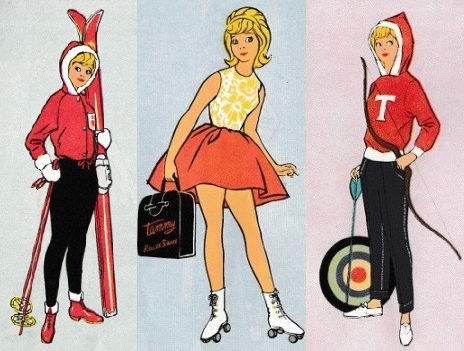 The fashion of the cat – super cool retro clothing ads! It’s official! Stuntman T-shirt. The Incredible Hulk N°301. 1984. US. 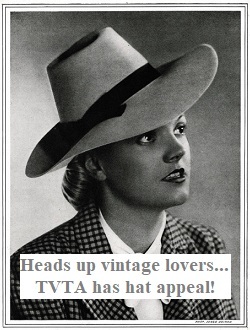 A TVTA Fashion Exclusive !!! Wooof was so excited. The intrepid office cat had been busy preparing our Non-toy ad Tuesday segment when he came across a 1982 advert for Starburst sweatshirts! Cue one happy cat and the order form completed of our first featured ad. Right, time to fire up the office time machine in the name of fashion and exclamation mark overuse as we go shopping!!!!! Starburst Sweatshirt offer. Rampage Magazine N°54. 1982. UK. Official Doctor Who Peter Davison T-shirt. I want this!! Wooof, can you add it to our Doctor Who wishlist? Mrs Coldkettle the TVTA tea lady has been after a Cyclops tour jacket since 1994! Marvel streetwear. Perfect for kids, badgers and foxes! Wooof’s best friends in the TVTA neighbourhood is a gang of friendly badgers and foxes. Wooof’s promised to order them some cool Marvel apparel for their birthdays, as seen in the advert below. Such a thoughtful cat. Marvel Classics. Die Cut N°4. 1994. Alessandro the pigeon who lives on the TVTA roof has expressed an interest in a pair of these. JNCO. The Young All-Stars N°9. 1988. Matchbox T-shirt and Team Members’ Cap! Club gear awaits, courtesy of the Matchbox Junior Collectors’ Club! Matchbox Collectors’ Catalogue 1987/87. Australia. We’ll take twenty-four of everything thanks! The Star Wars Trilogy Special Edition Offers Catalogue. 1997. UK. Atari Super Cobra Flight Jacket. Perfect for TVTA’s retrogaming winter weekend parties in our chilly office (we currently have no glass in the windows due to Wooof’s erratic yo-yo skills – see here). Super Cobra flight Jacket. The Incredible Hulk N°292. 1984. US. This entry was posted in Fashion, Non-toy ad Tuesday, Wooof and tagged 1980s, 1990s, Atari Super Cobra flight jacket 80s, clothes, clothing, Fashion, JNCO Autopilot trainers, Marvel comics clothing 1990s, Matchbox Junior Collectors' Club, Non-toy ad Tuesday, Peter Davison official Doctor Who t-shirt, retro clothing, sci-fi clothing, Star Wars Trilogy official clothing, Starburst sweatshirts, Stuntman offivial t-shirts 1980ss, time travel, TVTA haute couture, Wooof, X-Men Mutant Gear clothing 90s on October 23, 2018 by The Vintage Toy Advertiser. ‘Why are you looking so perplexed?’ Wooof asked me this morning during my third cup of coffee. ‘It’s that predictive text thingy,’ I said. ‘By launching our very own public service picnic ad campaign!’ I said. TVTA’s Summertime Safe Picnic Initiative is proudly sponsored by Badgerworth’s Wasp-catcher Kettles and Foxes & Fangles Mind That Bear Exploding Monkeys. 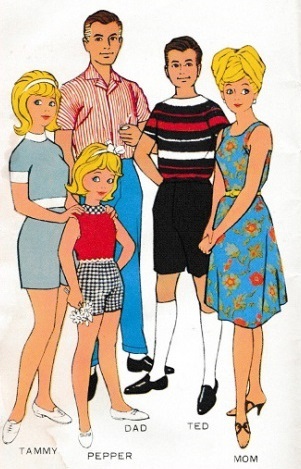 We asked 1960’s Tammy’s family for their top Dos and Don’ts when it comes to enjoying a safe picnic in style. The right look, the safe look! Below: Good show Tammy, that’s the safe way to picnic and you still look stylish! Don’t be a square, daddy-o! 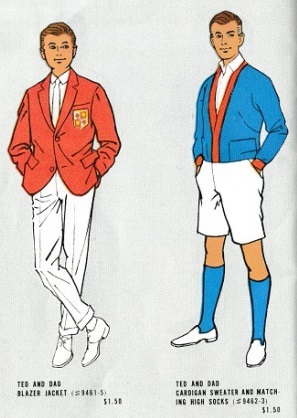 Ted and Dad are taking big risks by wearing such formal and warm attire to the picnic. 27% of picnic fatalities are caused by heat exposure and the rapid onset of mindless delirium. In severe cases the over-heated picnicker may resort to heinous criminal activity. Stay cool, but never be underdressed! Blimey Mom, watch out for your skin! 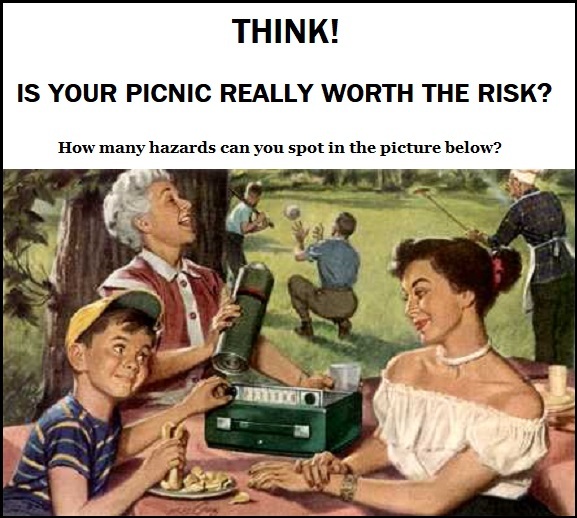 More than 32% of picnic fatalities are caused by deadly insects attracted to human flesh. In addition, serious sunburn injuries can occur within just minutes of exposing bare arms and legs on the picnic blanket. Don’t risk it. Cover up sensibly. Mom looks great for a woman her age, let’s keep her that way! Keep an eye on children at all times! More than 47% of picnic fatalities arise from children being taken offsite by wild bears, mountain lions, Komodo dragons and in rare cases sharks. … alright Pepper that’s enough, we get the idea. Stop freaking us out! So dear reader, this summer, be safe, be seen, be stylish, and most importantly enjoy your picnic adventures! And Wooof, please change the site logo back to how it was! 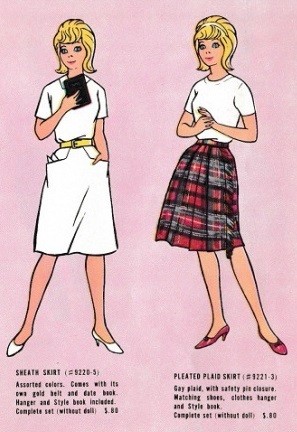 This entry was posted in Fashion, Non-toy ad Tuesday, Wooof, WORDS and tagged Fashion, nonsense, picnic accidents, picnics, summer, TVTA, vintage Tammy, Wooof, WORDS on May 22, 2018 by The Vintage Toy Advertiser. 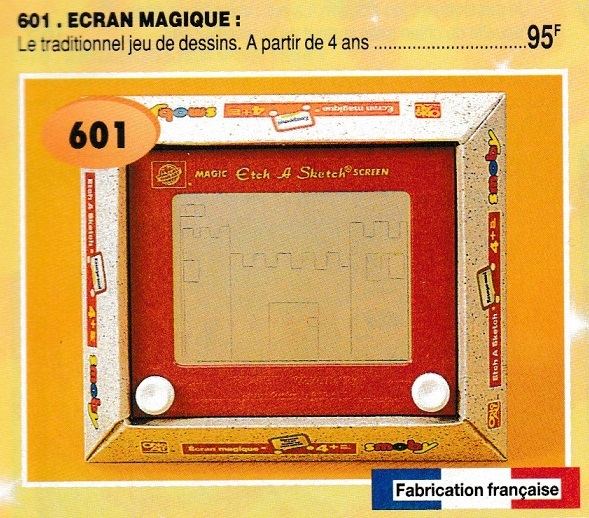 An original boxed French-produced Etch A Sketch marketed as Télécran in France, the country in which it was invented. 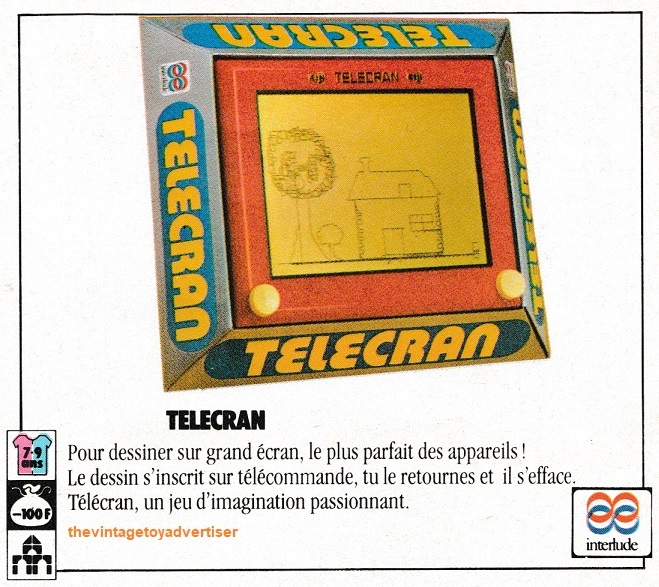 The linographic drawing toy Etch A Sketch was invented by André Cassagnes and marketed as Télécran in France. The mechanical drawing board is instantly recognisable with its plastic red frame and two white knobs. The knobs are turned by hand to control a vertical and horizontal stylus across an aluminium powder-coated surface which creates solid lines on the screen. 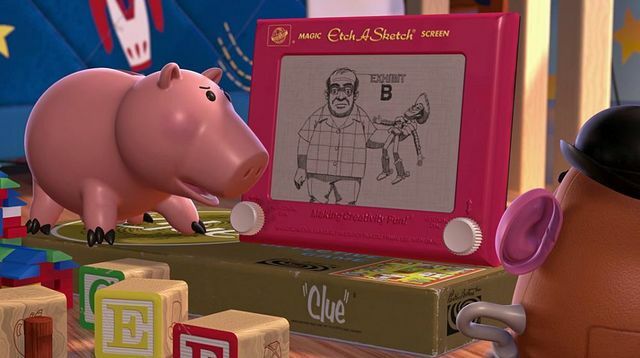 Etch A Sketch has proved an immensely popular toy throughout the 1960s to present times, winning numerous awards like the ‘Toy Oscars’, induction into the ‘National Toy Hall of Fame’, the ‘Century of Toys List’, recommendations by the French Ministry of Education, and character roles in all three Toy Story movies. You bet. I asked Wooof to test out our 1980s French version. Several hours’ later and three spent boxes of Catbizkit Chowbars, here are the stunning results, straight from the cat! The Vintage Toast Atomiser. 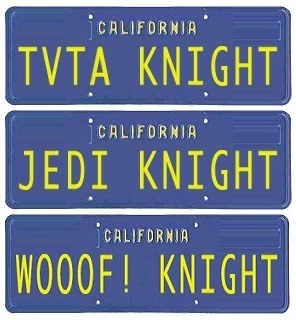 Nice attempt at a new TVTA logo, Wooof! Good effort, Wooof, at a self portrait! Télécran / Etch A Sketch. 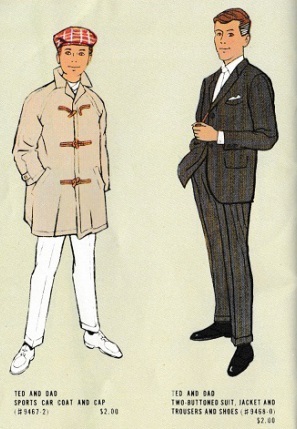 1960s / 70s. France. 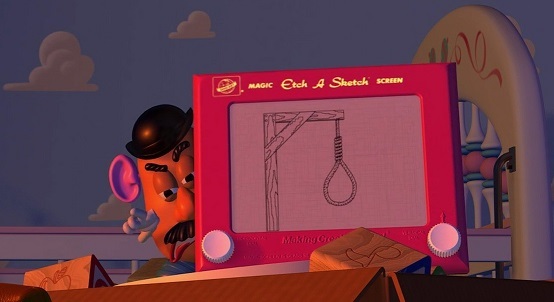 Etch A Sketch catalogue entry. Ets De Neuter. 1995. France. 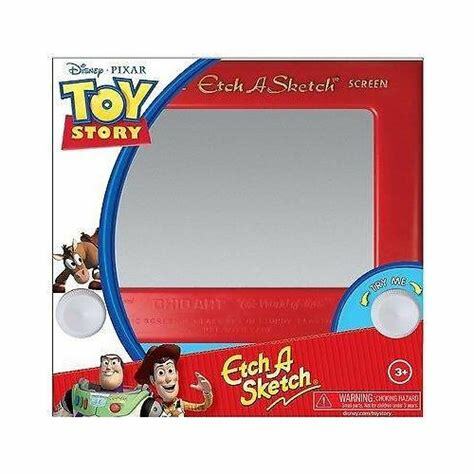 Etch A Sketch catalogue entry. Trampline. 1980. France. 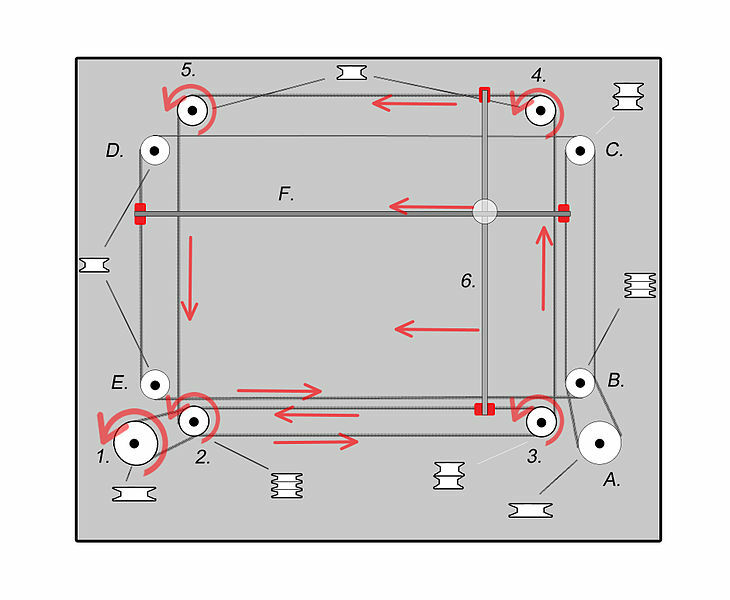 Basic mechanism of operating a 2-dimensional plotter. All of the numbered components correspond to those which move the plotter’s stylus horizontally, and the lettered components with those which move it vertically. Device consists of a series of 10 pulleys, 6 cables, 2 rails, and a stylus. 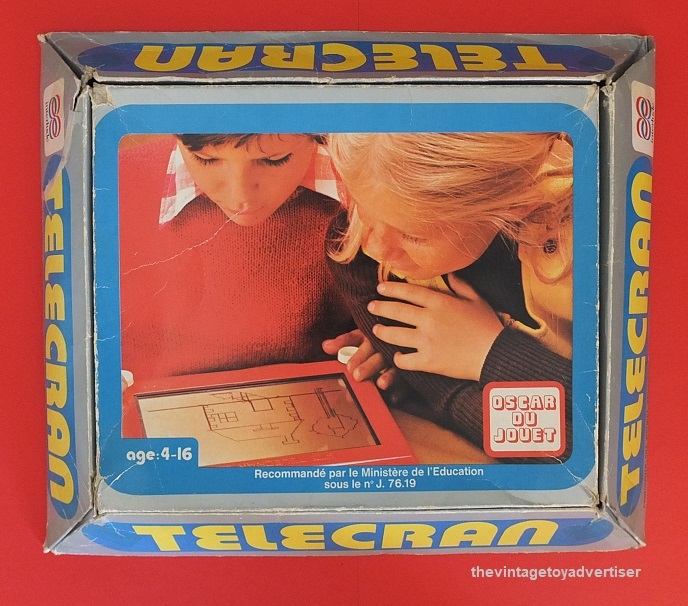 This entry was posted in ETCH A SKETCH, Wooof and tagged 1970s drawing toys, 1980s drawing toys, André Cassagnes, etch-a-sketch, Telecran, Toy Story Etch A Sketch, toys, TVTA, vintage art and design toys, vintage toy advertising, vintage toy adverts, vintage toys, Wooof on April 5, 2018 by The Vintage Toy Advertiser.